A friend of mine is a perfectionist. For many years, I thought I was a perfectionist until I came across her. Last week, we worked on a design project together, creating a brochure for a non-profit organization that places orphans in adoptive homes. The brochure was to be delivered to the printer yesterday. She’s still mulling it over. Two weeks ago, we started working on the layout and content. She was to provide the content to me, which she did, on time. It’s an 8-page booklet, a lovely mix of text, quotes, pictures and statistics that gets the message across. In two weeks, I have done seven revisions of the layout. With every version of the brochure, my friend takes two days to contemplate the design and layout. She shows it to friends, to other members of her team. She looks up brochures online and has an extensive collection of brochures from competing non-profit organisations. Her quest for the ‘perfect’ brochure has severely dented my respect for her, because at some point, that shade of orange works just as well as the paler one, and one turn of phrase is as good as another. At some point, the constant revisions become ludicrous and adversely affect my commitment to a project. She doesn’t know that I am writing (Natasha Ahmed is not commonly known among my friends, with one or two exceptions), so she won’t take my advice on the text or the headlines. And she keeps coming up with ideas for how to ‘tweak’ the brochure into better shape. She seems to have no tolerance for mistakes or accidents — not the kind that manifest as typos or design errors, but the kind that lead to great things, like the discovery of penicillin. And she’s always positive that everything can be improved. Last night, I had a frank talk with her that didn’t end well. It seems, however, as if I will finally move on from the project because she has agreed to ONLY check for typos and errors in the text now. She wasn’t the first perfectionist I have worked with. Years ago, before I married and started freelancing, I worked with a man who had a reputation for erudition and knowledge within the circles in which I moved. Like many young people, I admired and respected him, until I started working for him. He turned out to be an annoying perfectionist who was trying to run a business. His web and graphic design company shut down several years after I left. I worked for him for a year. When I left, for greener pastures, he cut off all ties with me. When we saw each other at public events, he would walk the other way. I learned from past colleagues that this was normal. Many of his ex-employees have the same experience. Apparently, by refusing to remain under his tutelage (he liked to turn every possible opportunity into a ‘teachable’ moment), we had disappointed him and were no longer worthy of being acquainted with his greatness. Maybe I’ve just had bad luck with perfectionists, but I don’t know if perfectionism can really be considered a virtue. Sir Alexander Fleming probably agrees. I think I would prefer to be imperfect, to be flawed, to be real. Isn’t that what attracts us to the characters we create in fiction? Even the superheroes of our imaginations are rarely perfect. It’s the damaged protagonist, the imperfect characters, that grip our souls and evoke the strongest emotional reactions, like Batman in The Dark Knight Rises, Lestat in An Interview with the Vampire, Mr. Rochester from Jane Eyre and Jo and Amy from Little Women (though I have a soft corner for Beth). It’s imperfection that often leads to the greatest creativity. Vincent van Gogh was actually inspired by Georges Seurat and wanted to be a pointillist. Pointillism is a style of painting created using dots, or points. Dots of primary colors are laid down in patterns that, from a distance, merge to form a picture. No colors are mixed on a palette and no bold strokes are laid on the canvas, just dots. It requires a significant amount of patience, something Vincent lacked sorely. His frustration with the slow and painstaking style led to a violent play of strokes that turned into one of the most powerful artistic statements in the world today. Where would we be today if Vincent had reined in his impatience and decided to stick to pointillism? 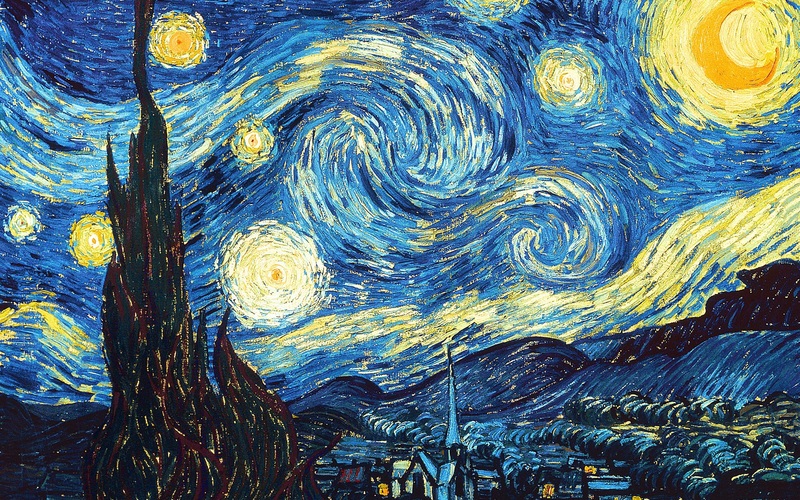 If he had striven for perfection as a pointillist, we may never have seen the starry night the way he did. There is an unspoken, unofficial view among artists in the tradition of Islamic Art: perfection is God’s domain. In many cases, illuminated manuscripts (before the advent of printing) were deliberately flawed, or ‘blemished’ in order to mar the geometric perfection of the design. It sounds superstitious, but in fact, it was akin to a second signature, a secret mark identifying their work. Nevertheless, the idea that perfection must be avoided has prevailed over the centuries. I am now in pursuit of imperfection. Like Charlotte Brontë, Christopher Nolan and Vincent van Gogh, and the Islamic illuminators of old, I will be striving to move away from deadly monotony of perfection and getting that sentence or that shade of orange just right. Nothing will ever be just right, after all. Because everything is about perception, and one man’s perfect sentence is another woman’s mangled string of words. Like this one.